The ZTE Kis 3 Max looks great and is very cheap, but it's let down by some very underpowered hardware. The ZTE Kis 3 Max is a budget Android smartphone with an incredibly low price of just £54.99 SIM free. It can even be had for less, with Argos offering the handset with a Virgin Media SIM card for just £30, though you do need to buy a £10 top-up at the same time. At this price point the ZTE Kis 3 Max is up against the Huawei Ascend Y530 and the Nokia Lumia 530 at the ultra-low end of the market. Even then the Kis 3 Max is still cheaper than both phones, with the Ascend Y530 available for around £85 and the Lumia 530 selling for as low as £60. ZTE has previously shown with handsets like the ZTE Blade Q Mini that it can do a good job of building a decent handset for an excellent price. Will the ZTE Kis 3 Max be another successful budget phone, or have there been too many compromises in order to reach that ultra-low price? Considering its price, the ZTE Kis 3 Max is quite an attractive smartphone. Its flat, rectangular chassis is reminiscent of Sony's design for the much more expensive Xperia Z3 Compact. There's little chance that you would mistake the ZTE Kis 3 Max for a flagship phone, but at first glance you wouldn't think it cost as little as £60 either. 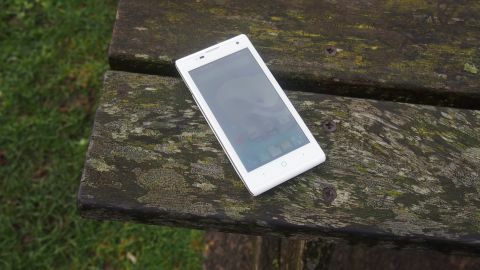 In comparison, the standard ZTE Kis 3 has a more rounded and traditional design that makes it look like a cheap handset. When directly compared the design of the ZTE Kis 3 Max looks far nicer and has a more expensive feel, even if the price between the two handsets isn't that much. On the front of the handset the bezels that surround the 4.5-inch screen are pleasantly thin, giving prominence to the screen and making it comfortable to hold. Below the screen, the three standard Android buttons (Back, Home and Recents) are given a minimalist makeover that drops the icons in favour of two dots either side of a circle. It suits the aesthetics of the handset well, though if you're not used to Android you may be confused about what the buttons do at first. The dimensions of the phone are 132mm x 66mm x 9.1mm, making the ZTE Kis 3 Max comfortable to hold in the hand. I was particularly impressed with the 9.1mm thickness of the chassis, which again helps give the ZTE Kis 3 Max a stylish look normally found with more expensive handsets. The ZTE Kis 3 Max weighs 135 grams which gives it a solid feeling heft without being uncomfortable to hold. In contrast to the front of the handset, which is mainly glass, the back of the chassis is plastic with a matt feel which makes it easy to hold. On the bottom-left hand corner of the back is a small speaker. If you're holding the ZTE Kis 3 Max in your left hand then the placement of the speaker isn't much of a problem. However if you're right-handed you'll find that the speaker gets muffled by your palm. Also on the back is the camera lens, a small LED flash and an understated ZTE logo that compliments the minimalist design of the Kis 3 Max. Each side of the ZTE Kis 3 Max's chassis is made of silver coloured plastic. On the left side is a micro USB port for charging and on the right is the power button and volume controls. Removing the back of the chassis reveals a removable battery, SIM card and microSD slot. Overall I was very impressed with the design of the ZTE Kis 3 Max, which is a good looking and well-built device considering its low price. The minimalist and stylish aesthetics make it look more expensive than it actually is.